Dragonfire 7 STRING Active Humbuckers come in your choice of Ceramic (81C) or Alnico (85A) styles. 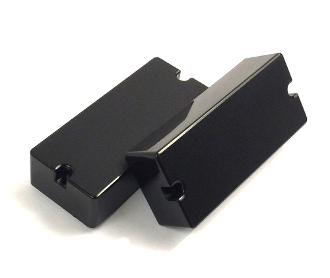 Rock & metal players can really amp up sustain, power and performance with these pickups. They go great with both classic and versatile set-ups. The Dragonfire Active 81C 7-String Pickup uses a Ceramic magnet for cutting-edge tone. This active ceramic pickup is great for delivering intense yet clean tones. The Dragonfire Active 85A 7-String Pickup uses an Alnico magnet for a warm, creamy tone. This pickup is smooth and not as harsh as the 81C, yet still plenty powerful! Choose either or both to make your own dynamic HH set. Choose a single bridge, a single neck or a matched set that is collaborative so the pickups will work in conjunction with one another for best possible performance. Sets can come as 81C-81C or 85A-85A matched sets or as the classic and versatile 81C-85A combination. These pickups are great for most styles of play. For proper performance and tone, we recommend 25K pots, .1 tone caps, and a stereo jack (sold separately or included with set purchases). These active pickups are standard 7-String covered humbucker size. They are not the same size as uncovered pickups. It is important to check your measurements prior to purchase. Basic wiring instructions will let you know which wires are hot and which are grounds as well as the most basic of connections. Due to the vast and varied nature of possible set-ups, we do not provide specific information or diagrams for installation. You should be able to use the simple information we provide to match up with any diagram or instructions you choose to use. Installation requires soldering and compatible system. We provide enough pickup lead wire to complete installation wiring in standard usage situations. If you require additional length, contact us PRIOR to purchase. Use only the provided pickup connection cables. Though these pickups work well with EMG systems, they will not work with EMG Style cables. Nothing else is included. Any extra images are provided for additional reference and comparison purposes only. There are no diagrams or instructions provided with this item. Do not purchase if you are unsure of your ability to successfully complete installation.